We’re happy to introduce a new strip today… meet Tough and Wiener! 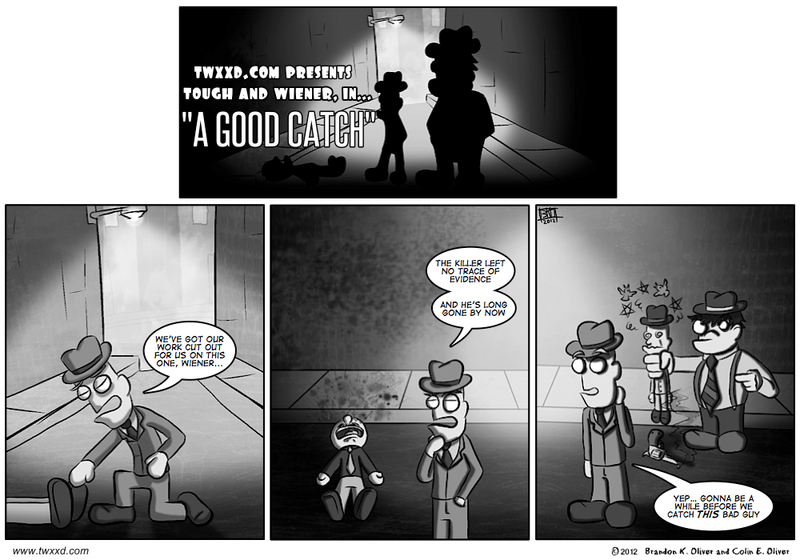 Tough and Wiener are a couple of gritty 1940’s detectives, out to save us all from the denizens of the city. The little guy, Tough, is a fast-talking quick-thinking ace detective with something to prove. His parter, Wiener, well… he doesn’t talk much. The format will be a combination of one-offs and short story arcs. We won’t have specific days for posting them, but you can expect these guys to rear their heads from time to time. Yeah, that’s right, we just added more variety to our variety of strips. That and I’ve missed doing black and white strips for a while now. This came up because of some Home Hardware store owner names and C and I playing L.A. Noire. How’s that for a combination? I’m honestly starting to think of us as kind of a Mad Magazine with all our different ideas and strips…and I’m kind of ok with that. T’other way ’round, actually… but your way makes a much better line :). Oh silly me, I thought Weiner was the little dead guy. Lol, all good! The names were meant to be a bit misleading. I like this, see. It’s gonna be good, see. With dames, see. Lot’s of dames, ngah. See? Well said Saeed! LOL! Love the comic you two! There’s an emoticon I have in MSN of a little blue guy dancing a jig… really wish I had it here, it would be perfect :). This is a swell idea, with great art! Looking forward to more of this strip noir! Thanks Mark :)! Agreed, B pulled out the stops on this one. Or Wiener Tough, I suppose :). He’s right in front of him isn’t he.